I am a Trini currently living and working in Guyana, with the good fortune of being able to hop around some of the beautiful places in the Caribbean, all the while learning how to use my camera. This blog started off as just an extension of my Flickr photos, and then I started writing actual posts which morphed into a mostly food blog. “People wondering about my name? Years ago, when I was signing up for a free webmail, my own name was taken. So I decided I wanted something Trini. Not sure how I settled on chennet, but maybe it was in season. Couldn’t miss it if it was, since the neighbours across the road used to have a biiig tree that filled up the view from my bedroom window. College is not really an option. Caps and gowns don’t come in that size anyway. * Answers to Questions – Hmmm’s Questions! I hope that you are in good health. I am a Trini who’s married to a Guyanese by the way. Not that it’s ground breaking news but just thought I’d mention it. I was wondering if during your travels you managed to get the recipe for maleeda. It’s a sweet made for muslim religious ceremonies. It is apparently made from paratha and contains raisins and other spices. I’ve been searching far and wide for the recipe but can’t find it anywhere. Hi Shamilla. Do you live in Guyana or T&T (or outside)? I can actually give a recipe for maleeda. My grandfather use to make this – about the only thing he probably could make; even my grandmother made the actual paratha. Hang on a few days and I’ll get it from my mother. Hi Theresa – ok I am home again with my mother. Tonight I shall post a recipe. For sure. And email you 😉 Do you know how to make the paratha/buss-up-shut? or should I include those instructions? Hello chennette, good to see bloggers from the caribbean. keep up the good work. My name is Aleisha and I live in Florida with my husband. I come from an east indian home and love to make the curries and other dishes for my husband. He love the aloo pies and phoulourie. Have not tried the sweet stuff on him yet. I was wondering if you have a recipie for beef pie. I have one for currants roll but none for the beef pie. Can you help me find one? Hi Aleisha – your post got caught by spam and I missed it – sorry. I will look around for a beef pie recipe, or give you on I’d use. You mean the flaky pastry baked beef pies right? Not the fried, almost aloo-pie beef pie? Thanks for stopping by my site! You’re absolutely right about these wacky Californians and their inability to dress weather-appropriate! As it turns out, one of my best friends is Guyanese! An old college roomate who I adore. Good times! Hope you’re liking it over there. Hi Danielle and welcome. Still in Barbados for now, but back to Guyana in a few weeks. Just wondering if the images you have posted can be used for commercial use. I work in advertising and I must admit it is very difficult to get good images of indo-trini food unless we hire photographer. Can you let me know what your requirements are for using your photos. We would like to request that you change your records to reflect our hotel from ‘Coblentz Inn’ to ‘Coblentz Inn Boutique Hotel’. I read your blog but didn’t read about you. It’s imaging. Your flickr is quit different and love it. Why you stop blogging? startup and waiting to read your blog. I am from Trinidad and Tobago. But currently live in Guyana, mostly. Will blog about Eid by tonight then back to regular blogging too! I was just going through your blog and as funny as it seems you seem to talk about every Trini food/fruit but chennette itself. Sup with that? The word itself brings fond memories from raiding the neighbor’s tree at night and having to endure simultaneously whilst sucking the sweet chennette some serious mosquito bites, to that fact that the only people I know used to sell chennette were sprangers and it was always ‘dollah ah bunch.’ In fact one brother told me chennette comes from the Arabic word for grapes. Heard that before? So what is your story with chennette besides it being a big tree in your neighbors yard blocking your scenic view? yes, I know someone would catch me out on that one day. what can I say? the neighbours haven’t had the tree in years, but Chennette just became my online identity so long ago. 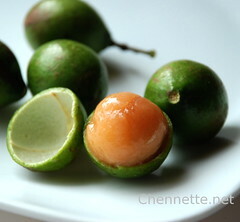 And when I started this blog (2 years ago) I knew I should post on the fruit itself rather than the sobriquet…but while I have had some chennet in Guyana, there were these really small ones that I didn’t photograph and in Trinidad recently, I couldn’t bring myself to buy at the couple intersections from the possible sprangers…but I saw a vendor here in Guyana with some decent looking ones, so I will make an attempt. Hi Chennette i really like your pictures..i just wished that i could use some of them for my book. let me know..chef in london. I am a Guyanese, my grandmother told us that her family were Syrian, but as we didn’t know of any other Syrians in Guyana, I guess we took it with a grain of salt and thought that we were just part of the Indian indentureship story. Now I realise that she might have been telling us the truth, she mentioned that her family had landed in Barbados from Syria then moved to Guyana. They were a family of goldsmiths. I would welcome any info you have on tracing the Syrian immigration to the Caribbean. HI EK – well Syrians and Lebanese came to the Caribbean at the end of the 1800s/early 1900s. This link gives you some history and other readings with respect to the arrival in Trinidad http://www2.nalis.gov.tt/Research/SubjectGuide/SyrianLebaneseinTrinidadandTobago/tabid/283/Default.aspx which might help to get an idea about arrival in other countries. Some of my grandfather’s family actually went to South America – Brazil or Venezuela before he ever came to Trinidad. I know they went to Barbados and Jamaica also – it’s entirely possible that someone from there moved to Guyana, especially if they were goldsmiths – goldsmiths of other heritage must have moved to Guyana for the mining resources! Nalis info is not complete as under religion no mention is made of Syrians who were Muslims and their descendants still being so. Nalis report is as if only Christians came to the West. My father’s eldest brother went to Brazil and the second came to Trinidad. They left Annazi from the city of Tartous, Syria before World War I, my father came before World War II directly to Trinidad. His second brother however preferred to live in Tobago. There are many relatives in Brazil from my father’s eldest brother. WoW I must say I stumbled on your site just this morning and I must say you certainly have alot of interesting information. I am a Trini muslim now working and living in Tobago, mind you the practices here are most certainly different from Trinidad but nevertheless, peaceful at times. Thanks for sharing your experiences with us all… Have a great weekend Eid Mubarak! Is that guinep I see there in the top picture…Man I can eat guinep all day long. They sell some nice sweet tasting ones in Riddley road market in London, however they are quite pricey and they only have them at certain times as they are seasonal. It has been almost two years since I’ve tasted Trini food. I’m so gonna live vicariously through your blog. Cool website. It’s interesting hearing about the Syrians on your site. I’m of guyanese background and my grandfather was also Syrian. It seems like I know so much about Indians, Africans, Portuguese, Chinese and know nothing about the Syrians. I’ve learned that there used to be lots of Syrians in Guyana at one time who were merchants to Guyana and were very good at commerce, but may have moved on for bigger markets, maybe such as Brazil and other places. What about Currystew. I heard that Trinis make Currystew. Me and my cousins roll on the floor when we heard this. My name is MR.Kashma Khan, and I am the curator of the Asja Archives and Museum. Is it possible to use some pics and info from time to time from your site ONLY for display and educational purposes?. Also I am working with the committee doing the Indian Arrival Re-enactment on Nelson Island next weekend and also Asja indian arrival celebration where we are mounting exhibitions. Can I use some of the material for these as well? I assure you that no commercial gains will be made from these. I stumbled upon your site by accident and I couuld not stop reading. I’m a trini married to a Guyanese and living in Florida. I do try and make trini food from time to time especially around the various holidays. The name Chennette certainly brings back memories. It’s called a different name here in Florida by the hispanic population. Keep up the good work , and do you have a good recipe for a true trini sponge cake? My mom back in her days made a great one.